Now let's get down to the ground and see how the power splitting and phase delays can be done in practice. Three antennas are still under consideration. Schematic diagram of the splitting-phasing box in Figure 5 shows it all. The transmitter sees the feed line VSWR as 1:1.125 provided the antennas are all 50 Ohm loads. For the purists the more accurate numbers for calculating the power levels to each antenna are here: Top antenna gets -3.025 dB, Middle ant. gets -4.964 dB and the Bottom ant. gets -7.470 dB of power available at the transmitter port of the splitter. 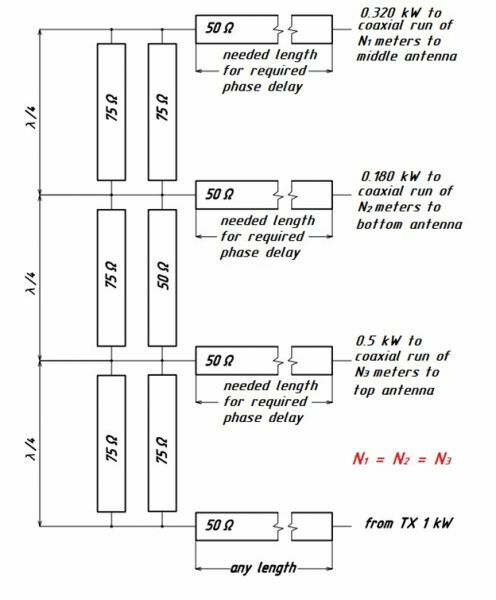 The phase delays are controlled by "needed length" cables provided that all feed line runs to the three antennas from the splitting-phasing box are of THE SAME length. The latter is important in terms of keeping constant the performance of the stacked array within the band limits. Splitting power to 2 or 4 antennas can be done in by analogy with shown scheme. The ratios can be different from shown depending on design. 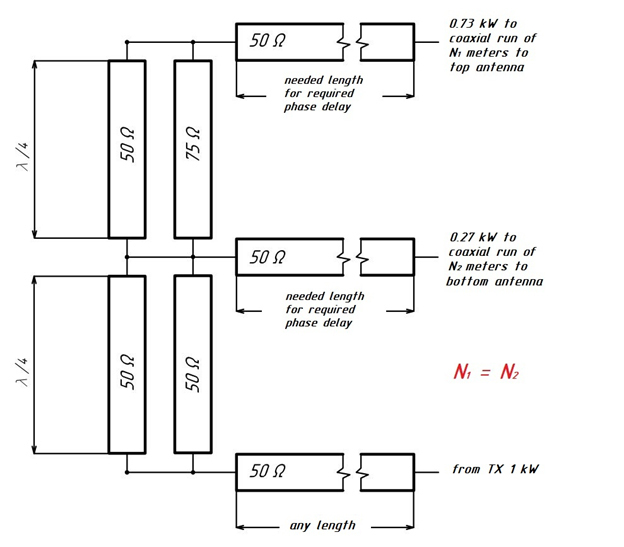 As an example see the splitter-phasing box for two antennas in Figure 6. The VSWR at the input port for this box is 1.08:1. A practical way of making the 5 coaxial feed line junction construction is shown in Fig.7. The length of quarter wave transformers should be measured from inner conductor plate to inner conductor plate. The braid plate can be bolted to chassis inside the box or just to the bottom of the box. See Fig.7 down below. I will now show a few more examples of UAPD patterns which prove that this aproach to feeding stacks is worth considering it a good alternative to the conventional method of feeding vertical stacks. The patterns are from one of my recent projects of two 54 meter high towers for Serge UA0SC. One tower carrying 540 (28 m boom) over 440, 820 (31 m boom) over 620 over 620 and a wideband 480 with VSWR less than 1.35:1 over entire band 3.500 through 3.815 MHz. See it on Fig.8. The other 54 meter high tower carrying a 5-bander atop and two stacks: 8 over 8 over 8 (20,5 m boom) for 15m band and 8 over 8 over 8 (15,2 m boom) for 10 meters. 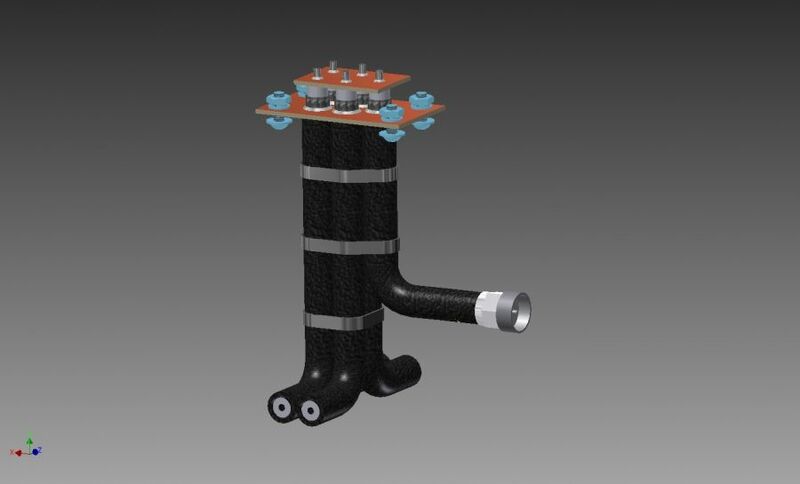 See its schematics on Fig.9. I again will have the patterns by pairs - black lined are the UAPDs and red lined are conventionally fed stacked antennas all with equal power and phased for the highest possible gain (on 40 and 20 meters the phasing had to be adjusted since the feedpoints of different antennas are not geometrically alined). 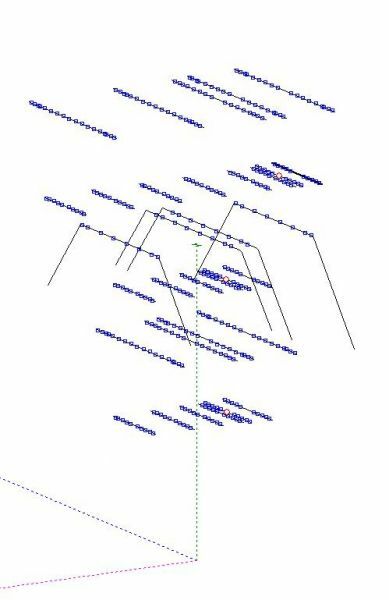 In all 3 antenna stacks power distribution was like in the diagramm on Fig. 5 and on 40 meter stack I used the one in Fig. 6. Phasing was compromised between the null fills, gain and overall pattern looks. 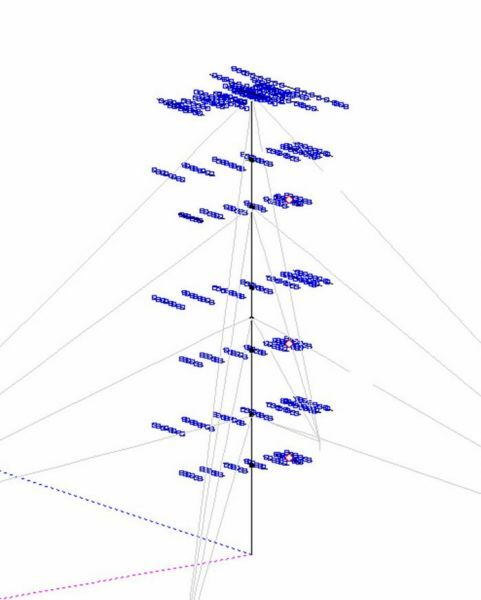 For instance, on 15 meters I couldn't get rid of pronounced interaction between the 15 and 40 m elements of the 5-bander topping the tower and upper 15m 8 element monobander, so the gain of UAPD feed on 15 m stack isn't higher compared to in phase version whilst on 10, 20 and 40 meters the gain when UAPD is higher! So, I hope I've given enough information for thought and maybe even a try. This UAPD is known for decades but in the navigation and radar bissuness when in need for cosecant patterns, and I just thought it'd be worth giving it a chance on HF. I thank my colleaugs that encaureged me to write the article. GL everybody with the big antennas! By Vladimir (Willy) Umanets UA9BA Chelyabinsk Russia December 2015. Part 1 Stacking Vertically Spaced Yagi Antennas. Great work, Willy. Is it Rating of 5 for 5 stars or 1 for top notch?